24. Oktober 2017 Carolin Hinz-SowadeVisit Bremenaccessibility, sightseeing tour, wheelchair.. Here she is, our brand-new sightseeing coach. During my maternity leave (did you miss me?! ), I spotted her on the streets of Bremen a few times. But with a baby and all the accessories in tow, I never managed to get a picture. But here we are now specifically for a photoshoot. ‚Why?‘, you might ask. Well, so that we can show off the new coach in all its accessible glory, of course! Accessibility is a subject very close to our hearts. Ultimately, we want to ensure that everybody has the same opportunity to discover Bremen. We’ve put together lots of useful information for visitors with disabilities – just check out our website. And Ingrid has already blogged about her tour of the city in our hire wheelchair, which you can borrow from the tourist information office at the Boettcherstrasse. 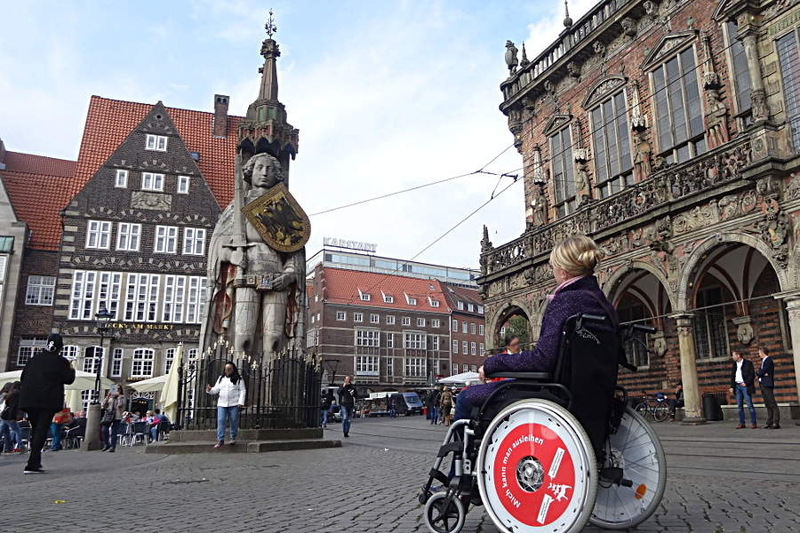 Visiting Roland by wheelchair – by hiring the wheelchair from the tourist information office, you can discover Bremen without any barriers, or very few barriers at least. When I’m out and about with the pushchair, I do at least get a slight sense of how important step-free access is. Of course, that doesn’t come close to the experience of wheelchair users, who have to consider accessibility day in day out. I certainly hadn’t given any thought to the wheelchair friendliness of our sightseeing tour. 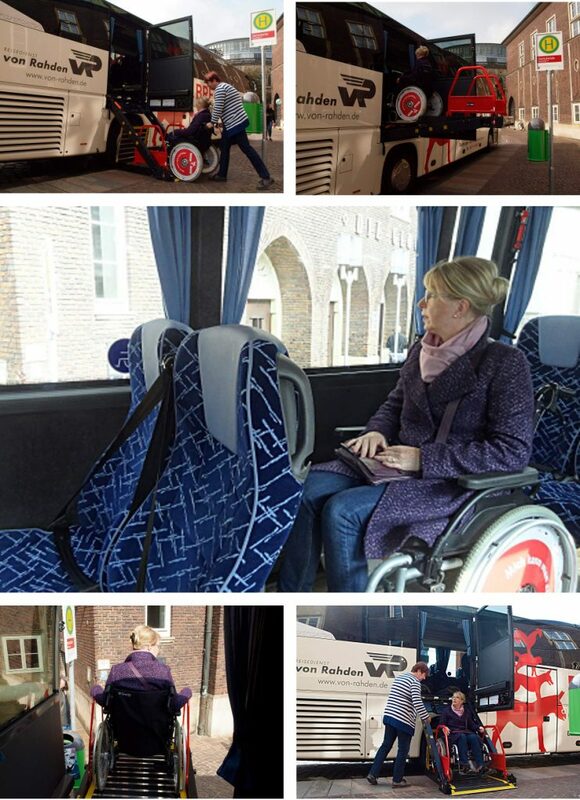 The new coach from travel company Von Rahden enables wheelchair users to board the coach in total comfort and enjoy a relaxing ride. Ute Schemming, manager of our tourist information office, tests the lift using our hire wheelchair and places herself in the trusty hands of driver Meike Hollmann. So far, around one wheelchair user has taken this sightseeing tour each month – the only way is up. ‚Up‘ is the operative word. As Ms Schemming finds herself raised skyward on the lift, she starts to feel a little uneasy. But Ms Hollmann knows what she’s doing and makes sure that the wheelchair and its occupant make it safely onto the coach and back down again. Up, in, relax, out and back down – the mechanised platform manoeuvres the wheelchair and its occupant safely in and out of the coach. 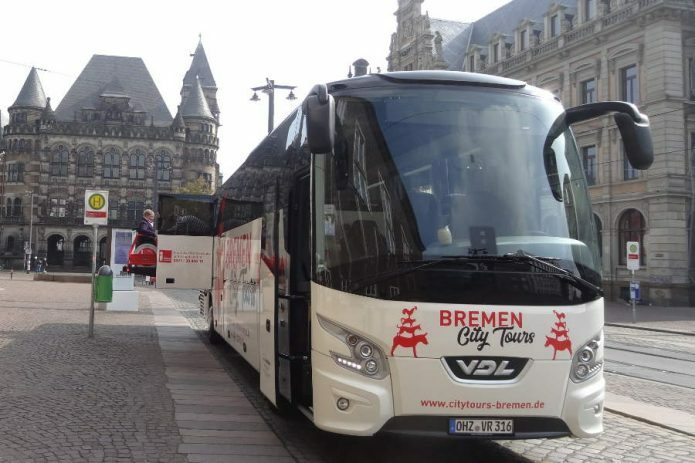 Inside the coach itself there is a dedicated space for the wheelchair, so the passenger can enjoy the tour in comfort and safety, admiring such sights as the Weser Stadium, the Viertel district and the technology park and university. The tour finishes back in Bremen city centre, by the Domsheide (in front of the Glocke concert hall), where we staged our photoshoot. You can book your place on the access-for-all sightseeing coach tour by visiting our website. Holders of a disability identification card (assessed degree of disability greater than 50%) and their carer each pay the reduced price of €12.50. 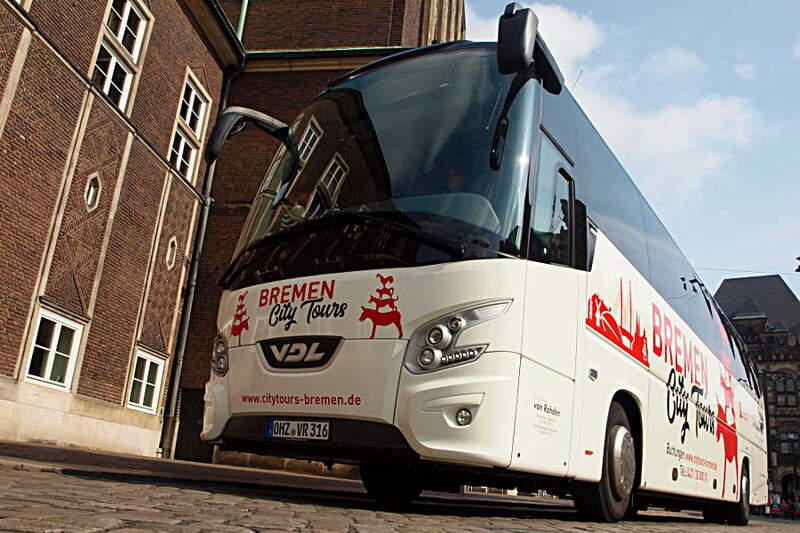 Looking good – the new coach for sightseeing tours of Bremen. If you want to find out about other accessible services and activities, visit our website. Or you can always contact our colleagues at the service centre on +49 (0)421 30 800 10. You can let us know about your experiences in the comments box too!